Being a fan of the game I was really looking forward to this title when it was released to the Australian public. 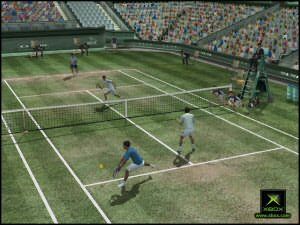 It promised so much, yet I was apprehensive as to how much of a contender it would be to the king of tennis games, Sega's Virtua Tennis. 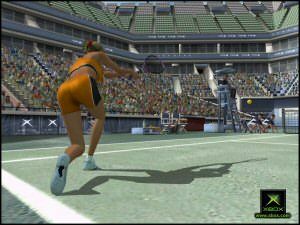 Virtua Tennis had it all as far as tennis buff's are concerned and this upstart to the crown surely couldn't have what it takes to topple the original. Well, I am pleased to tell you that it certainly can and did quite easily and it was with some resignation that I finally realised there was a new champ and it was this title. The very first thing that will strike you is how damn good this game looks. Every little thing you could think off is there and is as sweet as possible, leaving nothing to chance. This is one game that on occasion you would be forgiven for setting up your XBox to have it play against itself whilst you just sit back and watch. It's simply that good to play and look at, and that's something that in the past I would have only associated with a Madden NFL title where often I'll set the teams up and recreate games or try to simulate the Superbowl to see how it would come out. 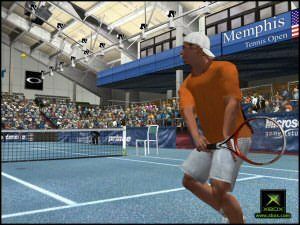 Control is key in tennis and this game would have to have the most intuitive yet indepth player control I have had the pleasure of coming across in a sport title. Your buttons are assigned to different types of racket strokes and you can also use the triggers on the left and right of the controller in order to perform specialised shot that in the past would have been a nightmare to perform. It's a simple matter of deciding what you want to do and then deftly using the control to make it happen. Complex or simple, Top Spin's control system is going to provide the goods for all. Whilst it seems like an easy enough task to just smack the ball around where you want it, Top Spin counters that by essentially making it a bit risky to start doing specialised hits by introducing a meter that many fans of golf games will be familiar with. When pulling on a trigger, a power meter will fill and you must let go at the right time or the game will cause you to err to your detriment as you would in real life by overhitting the ball out of bounds or dropping short of the net. It just makes for an even more immersive experience than I'd had with Virtua Tennis in the past and I was extremely impressed. Each player has been faithfully modelled and the animations are a treat to watch. As much fun as it is playing as your favourite player, many gamers will be thrilled by the ability to customise a character to look exactly like them. This would have to be one of the most detailed player creation modules that I have ever seen with every that you could think of covered, including the ability to deform some attributes in real time that will have you impressed or reduced to giggles as you mix and match body parts on the screen. As with many of the titles out there now you can take this game online and see your rankings on a leaderboard on the internet. If you weren't already addicted to the game, the ability to compete against others and get that gratification will most likely turn you around. I know that many gamers out there are still tossing up whether or not to get XBox Live but all I can see is that I consider it a must and well worth the 99 bucks to get you up and running for a year. Of course you do need broadband as well but with many areas now broadband capable there are so many great applications for the service that powering XBox Live is just another bonus. Player animations add to the sense of realism that Top Spins gives with numerous swings and other movements to contribute to the general eye candy that the game has. When in normal camera mode which keeps almost everything on court in view, you get the birdseye feeling that you would from a live broadcast, however it's when you get close up that you realise just how special the game is. There is so much detail jammed into the graphical element of the game that even close up you cannot really detect seams or other interfaces that so often become present when zooming in on action. Top Spin has catered for all gamers with a wonderful focus on quality gaming regardless of your preferred viewpoint when playing the game. Yet another thing I loved about this game was the fact that not unlike EA's Tricky series you could build up a meter that as you played a game enabled you to play with even greater control than before. Called In The Zone, its a fabulous idea that made that intense round all the more over the top as you tried to outplay your opponent in an knuckle crunching showdown on the spectacularly detailed courts. It's this sort of thing that really rocks my boat and it makes the title even more special to me for it's inclusion. 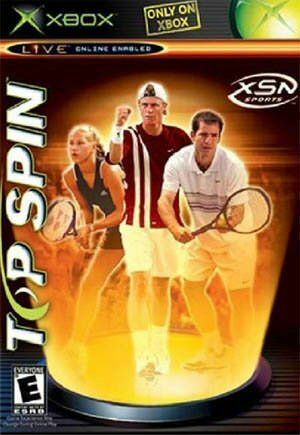 I'm sure that you are all going to love this title and even if you are not a sports fan, putting it simply this is one title that deserves to be in almost every games collection as a true classic it's just that good.. Do yourself a favour and have a go of Top Spin!